The Hammer Museum is hosting the first solo exhibition of Berlin-based artist Petrit Halilaj in Los Angeles. “Hammer Projects: Petrit Halilaj” now in its final weeks on display, will close on January 20, 2019. For this exhibition, a group of giant moth costumes is suspended at various heights, illuminated by custom flickering lights. Drawing his personal history and cultural identity, Petrit Halilaj constructs whimsical worlds inhabited by fantastical creatures and reimagined relics. Using humble materials such as sticks, mud, and fabric he has reimagined animals from forgotten places and times. “His affinity for animals extends beyond representation as artworks — on several occasions the artist has adopted an animal persona as a method of both disguise and metamorphosis. He’s been a bird, a dog, and most recently a moth. 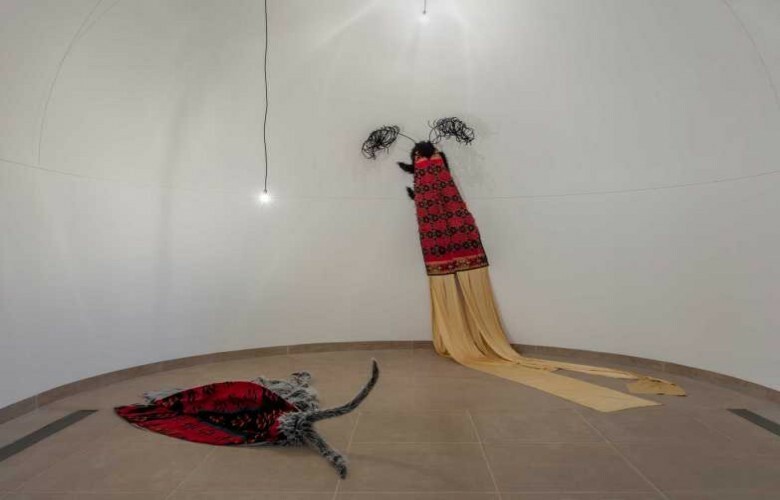 Working collaboratively with his mother, Halilaj crafted giant moth costumes using traditional Kosovar fabrics or materials like qilim, dyshek and jan carpets (they were shown at the 2017 Venice Biennale). For the artist they symbolize discovery, transformation, and concealment, and playing ‘Peter Pan’ to ‘Tinkerbell,’ he elevates the often-reviled insect to a more esteemed position in the animal kingdom,” the museum says. Petrit Halilaj (b. 1986, Kosterrc, Skenderaj-Kosovo) lives and works in Berlin and Prishtina, Kosovo. He studied fine arts at the Brera Academy in Milan. His recent shows include solo exhibitions at New Museum, New York (2017); Hangar Bicocca, Milan (2015); Kolnischer Kunstverein, Cologne (2015); Bundeskunsthalle, Bonn, Germany (2015); ChertLudde, Berlin (2014, 2011, 2009); Kunsthalle Lissabon, Lisbon (2014); and WIELS Contemporary Art Center, Brussels (2013).